The “Hallmark Effect” is working its viral magic on yet another religious festival these days. The Hallmark Effect is that process by which the original spiritual and religious value of a festival is gradually pushed out in favor of an over-commercialized, over-sentimentalized observance devoid of any real meaning. We can see the Hallmark Effect already castings its dire spell on All Saints’ Eve, St. Valentine’s Day, Christmas, and Easter, but with St. Patrick’s Day, the results are, by at least one count, even worse. The Hallmark Effect strips religious festivals of their original true meaning, but with St. Patrick’s Day, rather than simply removing true significance and replacing it with meaningless images, true significance is replace with drunkenness and green beer. 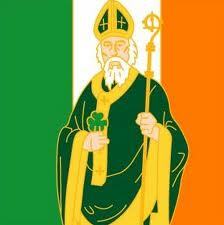 It is said that Saint Patrick’s Day is to bars, especially “Irish Pubs,” what Black Friday is to retail businesses. The saying goes, “everyone’s Irish on St. Paddy’s Day,” therefore, everyone has an excuse to go get drunk. If it did not bring in such money, you would think the real Irish in America would be up in arms over the outrageous racial stereotyping involved in such statements. Remember, of course, that “Paddy” was a racial slur for the Irish in the late nineteenth and early twentieth centuries. The term “Paddy Wagon” came about from driving around and arresting all the drunk Irishmen. I was blessed to go to Ireland in the summer of 1998. It was a fantastic trip and maybe even a pilgrimage of sorts. I was able to go to St. Patrick’s Cathedral along with numerous other churches and monasteries in Dublin, Galway, Belfast, and Kilkenny. While in Kilkenny, we awoke on Sunday morning and decided to go get breakfast before going to church. We were shocked to find that nothing was open. None of the restaurants opened until around eleven o’clock. When we asked why, we were informed, “Everyone should be at Church until at least eleven o’clock. Pubs open for lunch.” What is St. Patrick’s Day like in Ireland? Indeed, it is a rioting good time with a vast number of people hitting their favorite pubs, but it is also a national day of celebration, a bank holiday, where there are parades and festivals and the like. It is also a religious festival and a Holy Day of Obligation, a day on which Roman-Catholic Christians (around 98% of the population when I was there) are required to go to Mass under penalty of sin. Parades, parties, and pub-crawls aside, the day begins in Church with the Irish honoring their heritage and the saint who set them free from paganism and gave them a large part of their cultural identity. Just imagine if your local pub required a church bulletin for admission on St. Paddy’s Day! From the images you see around these days, you would think St. Patrick was a short, little red-faced and red-bearded chap with a clover on his lapel, a pint of Guinness in one hand and a bottle of Jameson’s in the other. This could not be further from the truth. Using today’s parlance, Saint Patrick was a hard-core radical. To begin with, Patrick was a Briton, not Irish. He was captured by slave-traders as a young man a sold to an Irishman. After developing a powerful prayer life while under such harsh conditions, he arose one day in response to God’s word and simply walked away from a life of slavery. Years later Patrick had a vision of the Irish pleading for his help. He was trained as a churchman by Bishop Germanus of Auxerre in France and returned to the Emerald Isle as what might have been the first missionary bishop ever. He first won the favor of the Irish chieftains and then received their permission to evangelize the various tribes. His work was overwhelmingly successful in his own lifetime and, within two generations of his death, the entire island had embraced Christianity. 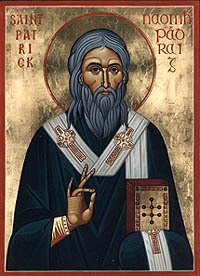 The role of the Irish missionaries and monks during the middle ages is practically legendary and is all due to the original evangelistic work of St. Patrick. “Where, then, will Coroticus with his criminals, rebels against Christ, where will they see themselves, they who distribute baptized women as prizes — for a miserable temporal kingdom, which will pass away in a moment? As a cloud or smoke that is dispersed by the wind, so shall the deceitful wicked perish at the presence of the Lord; but the just shall feast with great constancy with Christ, they shall judge nations, and rule over wicked kings for ever and ever. Amen. I testify before God and His angels that it will be so as He indicated to my ignorance. It is not my words that I have set forth in Latin, but those of God and the apostles and prophets, who have never lied. “He that believes shall be saved; but he that believes not shall be condemned,” God hath spoken. The saint pulled no punches. He declared to the whole nation that Coroticus’ deeds were worthy of damnation and that, unless he and his men repented, they would indeed be damned. He both comforted his own flock with the assurance that those who are baptized with Christ will rise again with Christ and reminded them that there is a just God who is not mocked. This year, amidst all of the corned beef and cabbage, bangers and mash, fish and chips, and shepherds’ pie, may we remember that “the reason for the season” is one man who dedicated his life to spreading the Gospel of Jesus Christ to an entire nation of people who were entirely lost in their own sinfulness.